In the present synthesis adaptation, preadaptation (in a broadened sense), and non-adaptation all all involved, and all can be assigned immediate, if not ultimate, causes. That all basically depend upon mutation is partly a matter of definition. That the mutations are spontaneous and random, at least in the special sense elsewhere defined, is a conclusion warranted and, with some restrictions, demaned by the experimental data. Calling them "spontaneous" and "random" simply means that they are not orderly in origin according to the demands of any one of the discarded theories. The incidence in time and the individuals affected seem to be random or nearly so in the same sense---that they do not agree with hypotheses that assume a more specific incidence. That the direction of mutations is entirely random is certainly not true; but neither is it true that mutations regularly occur in one direction only. Given a certain hereditary type of development pattern, the changes that can occur in it and their effects upon the structures developed are strictly limited, and alternative changes are not introduced in exactly equal numbers; but in almost every case the change can be and is in at least two, frequently more, different directions. George Gaylord Simpson, The Major Features of Evolution, New York: Columbia University Press, 1953, p135f. For those whose eyes aren't microscopes, here's the response. Thank you for your email of 11 August 2005 to the Hon Dr Brendan Nelson MP, Minister for Education, Science and Training, concerning Intelligent Design being taught within science curriculum in Australian schools. The Minister has asked me to reply on his behalf. The Minister strongly supports the important role parents can play in helping to shape school curriculum. 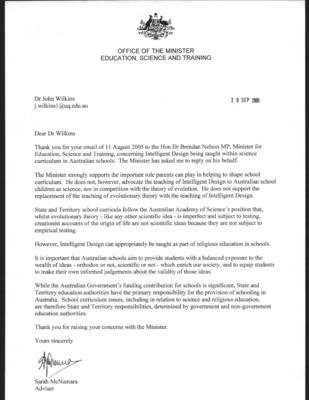 He does not, however, advocate the teaching of Intelligent Design to Australian school children as science, nor in competition with the theory of evolution. He does not support the replacement of the teaching of evolutionary theory with the teaching of Intelligent Design. State and Territory school curricula follow the Australian Academy of Science's position that, whilst evolutionary theory - like any other scientific idea - is imperfect and subject to testing, creationist accounts of the origin of life are not scientific ideas because they are not subject to empiricial testing. However, Intelligent Design can appropriately be taught as part of religious education in schools. It is important that Australian schools aim to provide students with a balanced exposure to the wealth of ideas - orthodox or not, scientific or not - which enrich our society, and to equip students to make their own informed judgements about the validity of those ideas. While the Australian Government's funding contributions for schools is significant, State and Territory education authorities have the primary responsibility for the provision of schooling in Australia. School curriculum issues, including in relation to science and religious education, are therefore State and Territory responsibilities, determined by government and non-government educations authorities. Thank you for raising your concerns with the Minister. And here I should leave it, eating humble pie and being prepared to offer my apology to the Minister (who might have said all this when he raised it in public). But I am a snarky fellow, and I must take the Hon Minister and his advisor (not adviser - that is an abomination up with which I shall not put) to task on a few points that are not grammatical or matters of plural forms (all "curriculum" above must be either curricula as a Latin plural or the more commonly accepted "curriculums" now it is an English word). My first concern is why should we teach a wealth of ideas? Some ideas are just silly and will confuse students. For example, should we teach students, so that they may make an informed judgement about its validity, that women not wearing the Hijab are asking to be raped? That is an idea out there that some Islamists have said in public in Australia. If not, why not that, but ID? It is equally offensive in a different way - it promotes one religious viewpoint (coincidentally the Minister's) and prevents the free investigation of knowledge, and will serve only to remove potential scientists and free thinkers from the meme pool. I wonder what other reason one might have for promoting this idea and not the Hijab? All scientific ideas are theories, imperfect and subject to test. That the theory of evolution is imperfect, and still the subject of study and modification, affirms that the theory is part of science. Many attempts to modify and expand the theory have been successful, showing (since Darwin's day) the gene-basis of inheritance, the basis of gene-reproduction in the double helix structure of DNA, the 'genetic drift' basis of the origin of breeds, and so on. Many challenges to the fundamentals of the theory have failed empirical test. The theory has attracted enormous empirical testing and remains one of the most powerful of scientific ideas. Hmmm. A slight difference. Yes, they are imperfect, but hey, guess what - science only retains theories that have been successfully tested and revised in the light of knowledge and evidence. OK, what does the AAS say about ID? The creationist account of the origin of life has been and remains an important idea in human culture. However it is not a scientific idea. That is, it is not open to empirical test. It is an article of religious faith. The creationist account of the origin of life is not therefore appropriate to a course in the science of biology, and the claim that it is a viable scientific explanation of the diversity of life does not warrant support. The Academy sees no objection to the teaching of creationism in schools as part of a course in dogmatic or comparative religion, or in some other non-scientific context. There are no grounds, however, for requiring that creationism/intelligent design be taught as part of a science course. So, ID is not science at all. Fine. Teach it, as the AAS says, in religious classes. But what does this imply? Surely that ID is not-science, that it is, where it conflicts with science, not-true. So why should we teach it in religious classes? Are we saying to our students that religion is either false or just something that can get along with science? The Minister might like to ponder that question, and the implications it has for the role of religion in modern society. At any rate, I am vastly relieved to find out that the Federal Government isn't about to link funding to States and Territory education programs with a false religiously-motivated idea. “You should design a restaurant,” added Allah. Evolution - guided or unguided? This is a lot like several earlier claims that evolution is unplanned and did not have "Man" in mind. Is it true? Is this a logical implication of evolution by natural selection? Theists object to claims that the world is unguided, of course. It is a central tenet of their faith that God planned the world, and all its outcomes, and that He (or She) maintains control over the course of events. Asa Gray, one of Darwin's correspondents, and a leading ornithologist in America at the time, held that God provides the variations necessary for the outcome He (or She) wills in evolution. Darwin was, in my opinion justifiably, unhappy about this. Do we need to conclude that evolution is a guided process? the answer is, scientifically, no we do not. Evolution is a naturally-occurring process that, as the letter says, follows logically from observable facts about the biological world (although I would cavil at the implication that it is all down to natural selection). No guide is needed - the outcomes are entirely consistent with the presumption that design is absent in these evolutions. Guidedness is (scientifically) something to be forced upon us as a conclusion - it is an onerous hypothesis. Do we need to believe that God guides the world? then it is obvious that we do if we are theists, since for theists that is what being a theist is all about. For those who believe, guideness (under the name of Providence) is a default assumption, and science is held, rightly, by them not to be able to reject the "providential hypothesis". Only, providence is not a scientific hypothesis. It is a doctrine, a matter of faith, and an outcome of revelation, not investigation. So when a scientific theory is under consideration, the Nobel Laureates are entirely correct - evolution, as a natural process, is unguided if there is no evidence or conceptual need to posit a guide. Guided evolution is only a justified conclusion when we see evidence that in a given case, there is some kind of direct intervention. The two questions deliver answers that seem to be in conflict. But they aren't, because they answer different questions, don't they? Answers can seem to conflict if you don't carefully disambiguate the questions they respond to. A famous example is one I like a lot - the WIlly Sutton case. Willy, a prisoner convicted of bank robbing was asked by a priest, "Why do you rob banks?" Willy replied, "Because that's there the money is". Willy answers a different question to the one the priest is asking. The priest asks, Why do you rob banks when that is a wrong thing to do. Sutton answers the question, why do you rob banks rather than, say, drug stores. His answer makes good sense if that is the right question, and is a non sequitur for the other kind. So the answer to the question is evolution guided? is No if it is a question of scientific knowledge, and Yes if it is a question about God's role in the world. But this seems wrong to theist evolutionists. Surely the latter question trumps the former? Well, no, because the former question is one of explanation of difference between guided and unguided processes. An unguided process is one that lacks a (worldy) intervention. Water running down hills is unguided. And evolution is a process like that. Of course, theologically one can say that water is guided down hills if you like, but that won't fly as a scientific hypothesis. Either everything is guided by God, including unguided natural processes, or there's no point in being a theist. But nothing is added to the scientific explanation by saying that God created the world and supports it, etc. It is either a truism or unknowable. So don't get upset that evolution is held by science to be an unguided process if you don't get upset at the hydrological cycle being unguided, and if the evolution case bothers you, so too should meterology. Invade America, and establish democracy there!